Prev Let’s Host a Pan Party (Easiest Potluck Ever) Next Yummy Gummy Candy Summer Drinks for Kids! Hey NBA fans! If so we’ve got a food craft for you! Are you in the in the midst of NBA Finals fever like me and my family are? This is now the 4th years in a row that Golden State Warriors take on the Cleveland Cavaliers. My kids, my husband and I are following the final games closely and we are constantly discussing the possibility of a Warriors sweep (we DO live in the SF Bay Area, after all…), sending each other memes from the games and just generally boring the people around us with our constant basketball chatter. 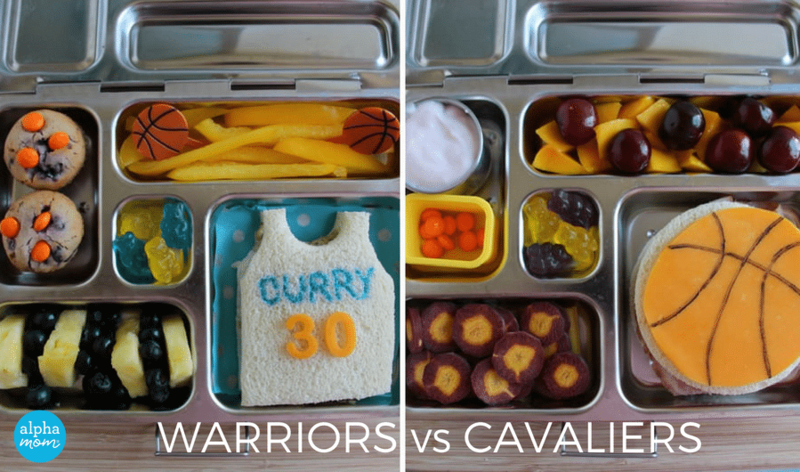 My youngest son is particularly interested in it all so I decided to make him a fun Warriors bento box lunch to take to school. Do you root for LeBron and the Cavs? Don’t worry — I have a bento lunch you can make, too! (But please don’t tell Steph, KD and the other Dubs! I don’t want to jinx things!) Not a fan of either team? You can use most of these ideas and adapt them for your favorite team — just substitute fruits and veggies in your home team’s colors. Start by trimming the crusts off two slices of bread to make a rectangle shape. I like to stack the pieces of bread on top of each other before I cut them so the finished shapes match. Use a small circle cutter (find source above) to trim a neck hole out of one of the short ends of the bread slices. Use the larger cutter (find source above) to cut armholes. Refer to the photo above to see what I mean. Now you should have a tank top shape. 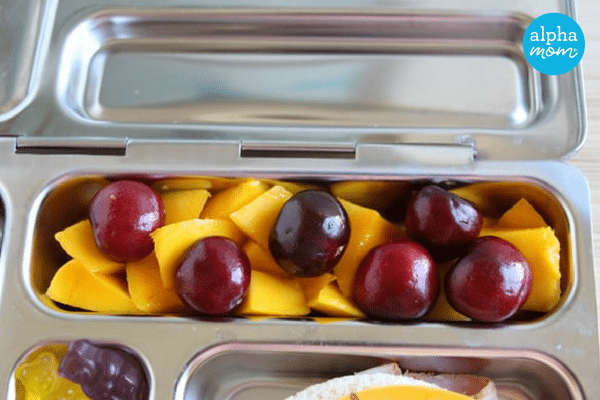 Check to be sure your sandwich will fit in the largest compartment of your lunch box. If it doesn’t, trim a little bread off the bottom so it does fit. 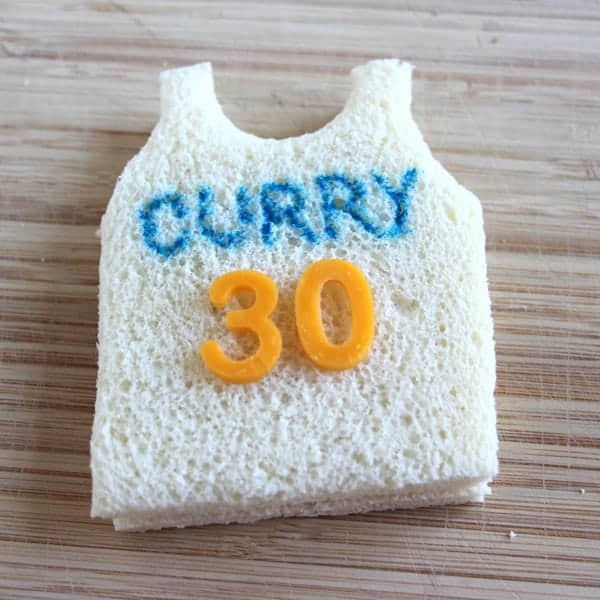 Use small number cutters to cut your favorite player’s number from a slice of cheese. Cheddar is a perfect match for the Warriors team colors, but use whatever kind of cheese you like best. Use a blue food-safe marker to write your player’s name on the jersey. Curry, Green, and Durant all fit nicely. You’re going to struggle to fit all the letters if you want to write Iguodala, Pachulia or Livingston. Forewarned is forearmed! Place the cheese letters under the player name on the top slice of bread. You can use a little mayo to “glue” them down if you like, or you can just put the sandwich in the lunch box as is and hope for the best. Fill the sandwich with whatever you like. I like to make a little curried chicken salad to pay homage to Stephen Curry, but turkey and cheese or PB&J are fine too. 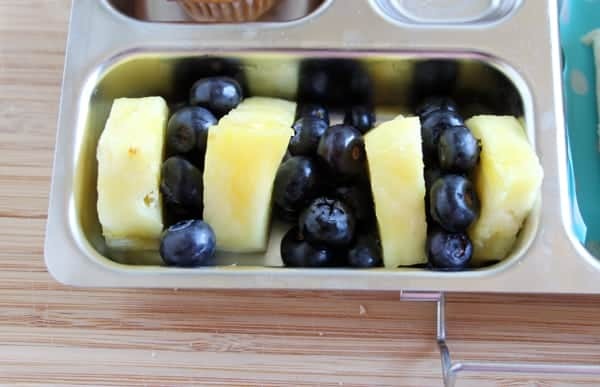 Next, add some blue and yellow fruit to one of the compartments. 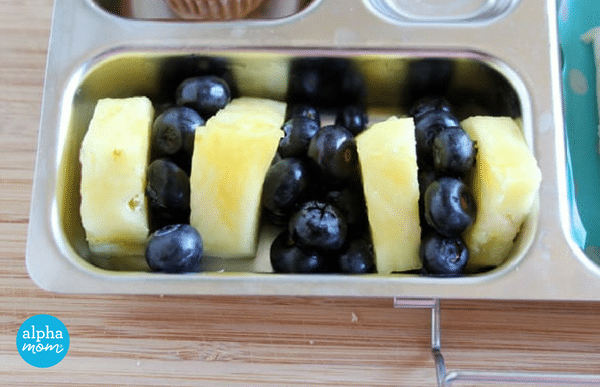 There aren’t a lot of blue fruits out there so you’re pretty much stuck with blueberries, but if your child isn’t a fan of the pineapple you could add any other golden fruit — mango or yellow peaches would work beautifully. 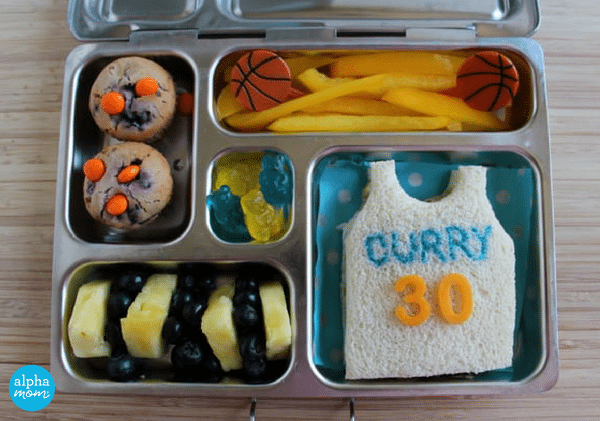 No Golden State Warriors lunch would be complete without a reference to Kevin Durant’s “Cupcake” nickname. KD has turned what started off as a mean jab into a bit of a signature by embracing the term. He even named a pair of his signature Nikes “Red Velvet”! 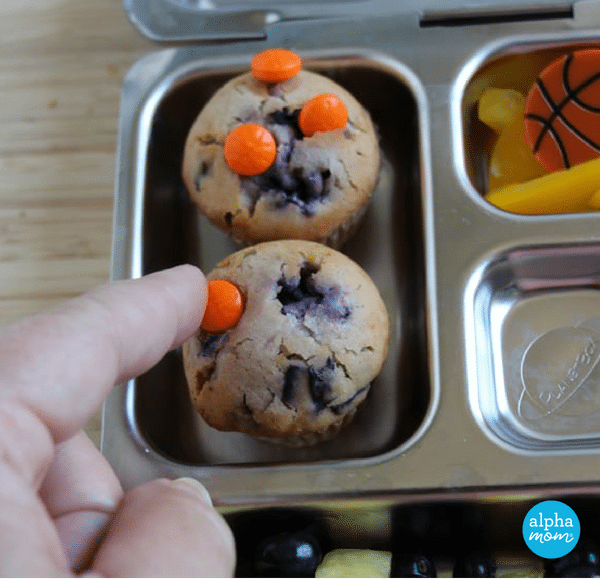 I opted for slightly healthier blueberry muffins in this lunch. Not quite the same as a cupcake, but close enough! Candy basketball sprinkles on top are a fun touch. 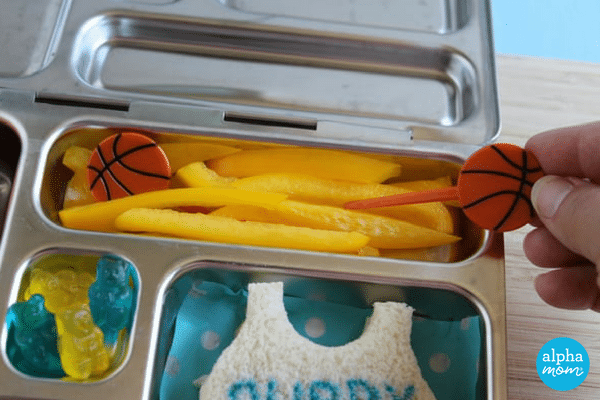 Fill the last compartment with yellow bell pepper strips, and then add a few basketball cupcake picks to decorate them. Other ideas for yellow veggies: corn, yellow tomatoes or yellow carrots. Blue veggies? I’ve got nothing. Add a couple of blue and yellow gummy bears and you have a lunch any member of Dub Nation would be thrilled to take to school with them! OK, now it’s time to please all those Cavaliers fans! 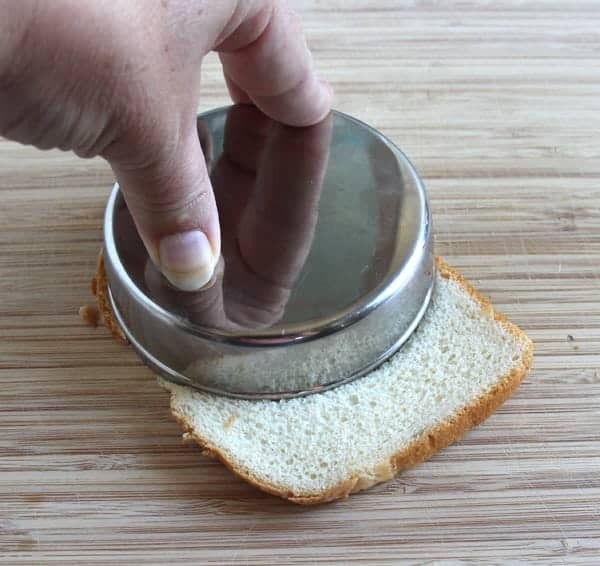 Begin by cutting two slices of bread into large circles. You can use a large cookie cutter for this, but I used the round dish that came with my lunch box because I knew it would be a perfect fit. 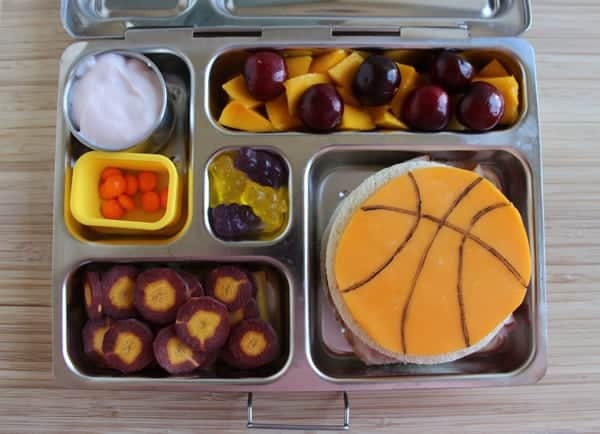 Use the same cutter to trim a slice of cheddar into a circle shape, then draw lines on it with a black food coloring marker to look like a basketball. 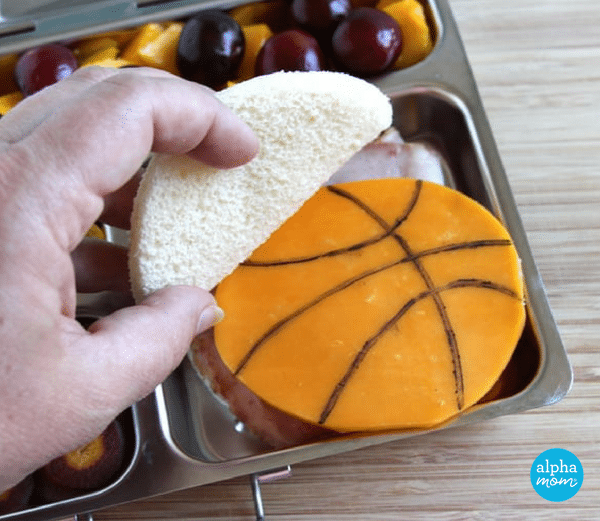 Fill your sandwich with ham and mayo (or any other fillings you like) then place the cheese basketball on top. At lunch time your child can slide the cheese into the sandwich as illustrated above — after s/he admires their beautiful lunch, of course! 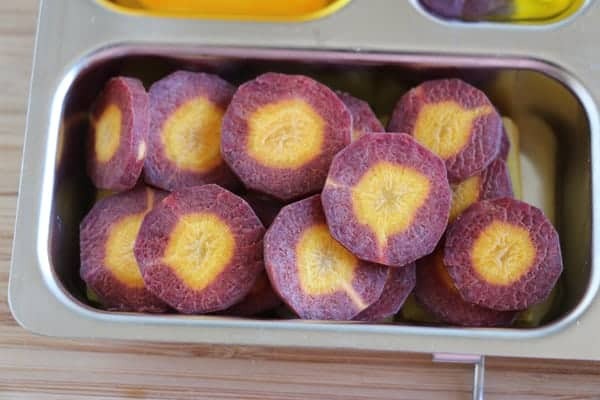 Cut a purple carrot into coins and add them to the lunch box. I’ve never found purple carrots for sale on their own, but you can usually find them in bags of “rainbow” carrots at the grocery store. They have a pretty gold core and when you slice them they match the Cavaliers team colors perfectly. Seriously, serve these at your next Finals viewing party. It’s like they were made for Cavs fans! Fill another compartment with gold and maroon-colored fruit. I opted for mango and Bing cherries, but yellow peaches, nectarines, raspberries or red grapes would all look equally nice. 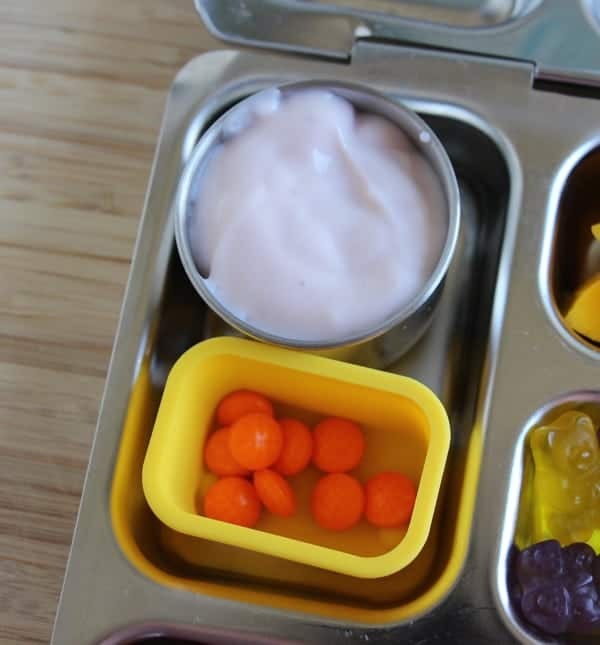 Round out the lunch with a small container of yogurt and a few basketball candy sprinkles that you can add at lunch time. 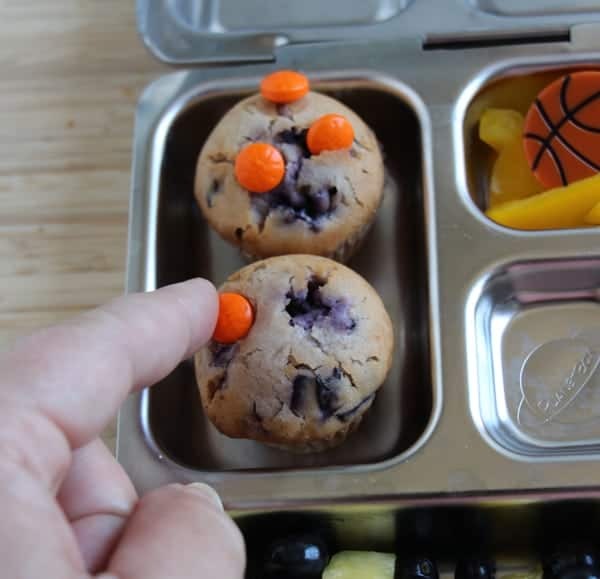 Finally, add a few purple and yellow gummy bears for a treat and this Cleveland Cavaliers lunch is ready to head out the door!